What? What was the noise that was driving the next-door neighbor’s dogs crazy? I walked from the garden to the flower bed. The squeaking could have been a bird, but it was no bird I spied in the flower bed. Rolled into a ball was a black snake, and in its coils was a baby rabbit. In the grip of the snake the rabbit was slowly being smothered to death. With every squeak the snake just squeezed a little harder. I thought of how easily we may be ensnared in the grips of sin, but the message was to come to me later. I had found a hoe, rolled the snake-and-rabbit ball out of the flower bed, and began my work. I carefully pressed the head of the snake to the ground so I could take her in hand. Grabbing her just behind the head I began to unfurl the snake. Out came the rabbit. The rabbit was still stunned, and I had to point it away from the dogs who stood on the other side of the chain length fence. Away it went. The snake seemed to be content to unfurl herself. She flicked her tongue and watched to see what my next move would be. As I held her out for the neighbor to inspect, the neighbor commented that it looked to be 5 feet. Judging by my height that seemed correct. The neighbor said she would have killed it. I said it would keep the Copperhead away. “Outa here. 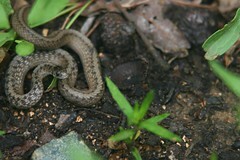 Over the fence, snake.” As I talked to the snake I cast her over the back fence into the overgrown field to hunt again. I say I was slow to see the message. I was thinking of snakes and tight squeezes. Later it dawned on me. The parable was there in the end. God had sent his Son to rescue me out of my tight squeeze.